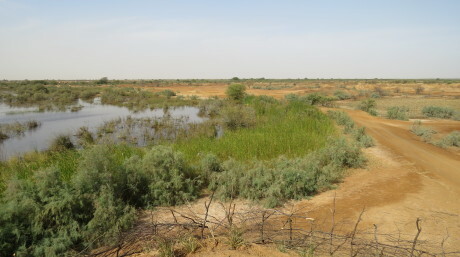 Barr al Hikman is one of the most important sites for waterbirds migrating through the Middle East. As part of our IWC50 campaign, our colleague Ward Hagemeijer led an expert team to survey this key site and to provide information that will help lead to the protection of the site in the future. Ward shares his experiences of this amazing site here. 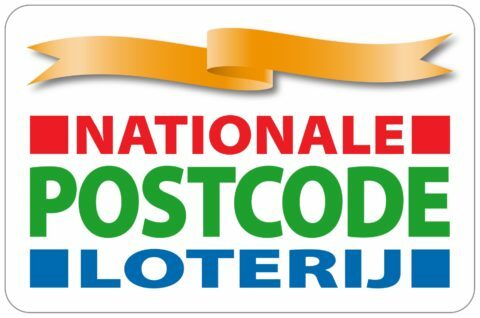 Thursday 21 January 2016 – After weeks of preparation and anticipation, the big day arrived: the 2016 counts in Oman! 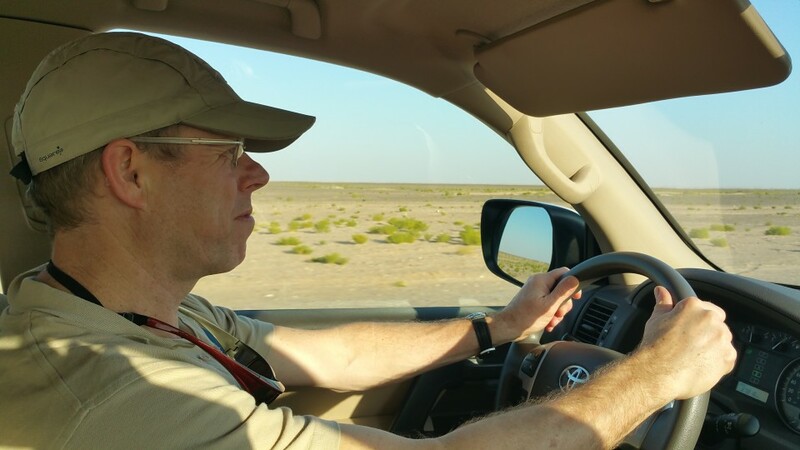 Last night we arrived in Muscat to prepare for this year’s counts at the famous Barr al Hikman wetland, which holds more migratory shorebirds than any along the whole West Asia/East Africa flyway. There is great interest and enthusiasm for the work we are going to undertake, for the International Waterbird Census (IWC) and for the IWC50 campaign. After a short night we met with the Ministry of Environment and Climate Affairs (MECA) and learned that Barr al Hikman is proposed to become a Ramsar site in 2016! Coincidently we also ran into Anada Tiega, the former Ramsar Secretary General, who, we learned, is helping to develop the national wetland policy for Oman. After sharing our plans of the trip, we picked up our permits and headed for the field. After a 450 km drive through the mountain and desert landscapes of Oman, we arrived at Barr al Hikman at the end of the afternoon. With the light of a setting sun, we drove up the sebkha and pitched our tents in the little dunes. The beauty of the sunset over the sebkha, the sounds of the waders in the air, and the smell of the sea, has filled us with excitement for our first count tomorrow. 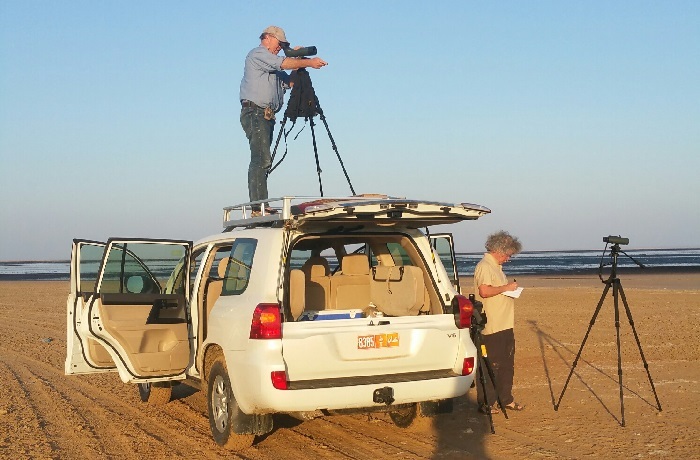 Saturday 23 January 2016 – This past Saturday we counted 70,000 roosting birds along the shoreline of Barr Al Hikman, and another 120,000 on the sebkha (the Arabic word for salt plains), and the mangroves nearby. Birds flock to the mangroves and sebkha during the high tide, as they are protected behind the line of little dunes. The sebkha looks deceptively accessible, but the salt layers can be dangerously soft and it is only possible to drive on existing tracks. This means large parts of the salt plains have never been counted, or at best only from a distance. Identifying birds and counting their numbers from a distance is difficult, especially when temperatures are high and the mirages distort the view. We set our telescopes up on the car to have a better view. The main concentrations are in an area behind the mangrove. Some parts can be easily counted. Thousands of waterbirds are so far away that they can only be identified as some sort of Sandplover, but they can’t be identified as either Lesser or Greater Sandplover from this distance. After only the first weekend, we counted 190,000 waterbirds, an amazing number! After the count on the salt plains, we made our way towards the mudflats and experienced the fantastic diversity of life in that part of this ecosystem. 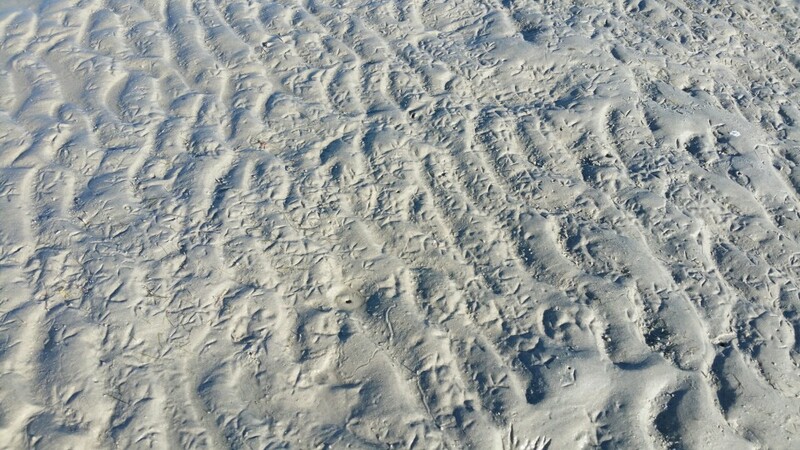 The footprints of the birds show how intensively the mudflat is used: every square inch is visited for foraging. Beautiful mussels, rays, cockles, sepia, and of course the birds, tens of thousands of waterbirds! What an amazing world! 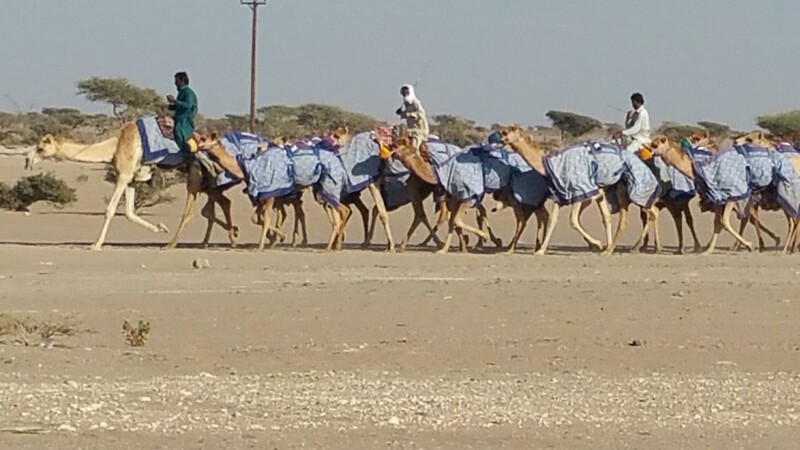 Sunday 24 January 2016 – This day’s IWC50 count of Barr al Hikman in Oman covers the land north of the Shannah harbour. The result was good and interesting sightings were made including a Barbary Falcon hunting for waterbirds. However, the highlight of today was a finding on the mudflats adjacent to our campsite, at low tide. Leon found a nice group of Great Knots and amongst them a bird with colour rings on its leg, probably marked by researchers all the way from Sakhalin in Eastern Russia! This very exciting record reinforces the global importance of Barr al Hikman, including as a home to the Great Knot, a species with populations under threat. Walking on the mudflats looking for the foraging birds at low tide is a very rewarding and exhausting experience. Three kilometres out, towards the sea, we observed the Bar-tailed Godwit and the Great Knot actively feeding on the mudflats, both are northern arctic coast breeding species. While Crab Plovers, that breed in the west Asian region, are seen on reefs further out. In shallow water pools on the mudflats, there are a variety of waterbirds, including, stints, shanks, herons, terns and flamingos. Fish are everywhere, include guitarfish, stingray, cuttlefish and beautiful fields of mussels. Fascinating! Back in Shannah, we saw several groups of Indo-Pacific humpbacked dolphins and some Hammerhead Sharks, swimming amidst groups of sea turtles. All of this shows how rich the biodiversity is in the coastal area directly surrounding Barr al Hikman. This is certainly a site worth conserving! Monday 25 January 2016 – The Barr al Hikman area includes areas of mudflats along the eastern shoreline, facing the island of Masirah. This is the area where we have our camp and where we have counted waterbirds until now. There is another area of mudflats in a bay a bit further to the west. This bay close to Filim is where we counted waterbirds today. The landscape is drastically different towards the west with more rocky outcrops and sand dunes. The mudflats seem to be softer and smaller in size. The waterbird count in this area is a complicated one. The area is difficult to reach and it is hard to get a good view of the birds. The count is specifically scheduled today because the high tide is hoped to bring the birds closer and into better view. The two teams approached the site from opposite sides and had to walk considerable distances to try and count all the birds. After a few hours of counting, walking and wading through the mud and sand, the results are only partly satisfactory. We feel we have a fair estimate of the total number of birds and most species have been counted well, but there are a few important groups of birds that could not be approached well enough for good counting and could not be identified to species level. Good knowledge of the local terrain, of the circumstances (like timing and height of tide), and of the (behavior of the) birds is critical for a good outcome of the counts and in this case we can improve on the understanding on how to best position ourselves for counting. We decide to invest time in the coming days to find better ways to get close to the important concentrations of birds and if possible to do another count of those groups. This can improve our own results and will help for future counts. Tuesday 26 January 2016 – The Omani Ministry of Environment and Climate Affairs (MECA), whom we introduced our survey plans to in Muscat on 21 January and who kindly provided the permits for our work, have come to Barr Al Hikman to join us in our IWC50 count. Badar Al Bulushi, Head of Wetland Environment and Marine Environment Conservation Department in MECA, wants to know more about the counts. He deals with the development of the Omani Wetland Policy and with the designation of Barr Al Hikman as a Ramsar site. Enthusiastically he and his colleague meet us at our base campsite. Badar wants to know: How are the counts done? what are the results so far? How can the data be used? What can be done once Barr al Hikman has been designated as a Ramsar site? 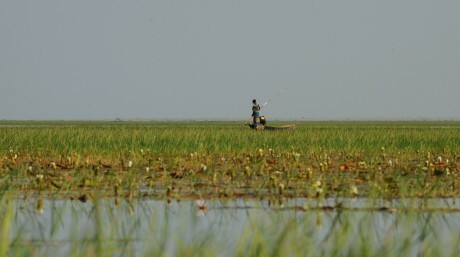 How can Wetlands International help? His colleague is eager to join the team. We try to help and inspire them as much as we can in the time before we have to start our counts of today. We take a group picture before one team leaves to count a faraway section at the Bay of Filim. The other team is to count more locally and the MECA colleagues will join part of that count today. Helping initiate and set up future surveys and monitoring work in Barr al Hikman and Oman in general is an important objective of this 2016 IWC50 survey. I am happy to see that taking shape. It is 22:00 in the evening. After a pitch dark start, with an amazing sky full of stars, the moon has risen and brought some light in the night so that I can organise my things and write my blog without having to constantly use a flashlight. The local count has generated a very high number of birds today. We are on schedule with the survey, the team functions well and is in good spirits and the total number of counted birds has already reached 410,000 after 5 days. We can all relax and go to our little tents for a good night rest. The air is filled with the twittering calls of one of most abundant shorebirds, the Lesser Sand Plovers and the sound of the sea, five meters away from where we sleep. Wish I could share those sounds with you as well. Approaching half a million waterbirds counted! Saturday 30 January 2016 – After a long period of stable quiet weather, the wind picked up in the evening of Friday 29 January and brought a lot of dust. Blowing with a such strong force that it is challenging our tents and all the gear and kitchen equipment that we had gathered in our basecamp. In Mahoot, the closest town and a little more inland, the dust is raging. At our basecamp in the shoreline dunes it is more clear, but the wind is equally strong. 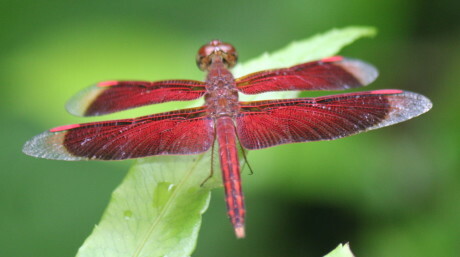 Insects seem to respond to the wind-fronts moving over as when we are sitting and doing the count-admin at our campfire, they come out in numbers, and disappear again as abruptly as they come out – praying mantises, beetles and millions of sandflies. We have been able to proceed well with the counts over the past few days. The total ‪waterbirds count‬ is approaching half a million now. After having counted the mudflat and sebkha systems south of Shannah, the coastal lagoons in the south of the peninsula provide a very nice change of scenery. Beautiful landscapes. The birds in these lagoons occur in somewhat smaller groups and it requires relatively a lot of time to get these areas counted well. A setback is that one car broke down and it took nearly two days to get it replaced. Only one team could continue counting during that time, so we lost a bit against the schedule. Spending time around the base camp allows us to read colour rings on the legs of marked Crab Plovers, look at the foraging groups of waders on the mudflats and take pictures of the local birds like the Desert Wheatear. Few days of counts to go and it looks like we will be able to fully count the site, which would be a fantastic result! Sunday 31 January 2016 – Final day of our 2016 IWC50 count. The island of Masirah is our target of today and we specifically aim to count the bay north of Ras Dha on the east side of the island. The numbers of waterbirds are much lower than on the mainland. We are not able to see whether the island of Mazirat Shaghaf holds any birds. This might be worthwhile trying to cover in future surveys. Gulls and terns and low numbers of waders are spread along the coast. Small groups of sandplovers are found resting on the beaches. The numbers of Egyptian Vultures along the shoreline are remarkable. Masirah is a fantastic looking island. Stunning scenery with nice transitions from beach via desert to mountains, mostly barren and in various colours, with beautiful wadis. Unfortunately there is a considerable amount of settlement-sprawl happening on the beaches and associated pollution is a problem. We visit the southern tip of the island in the hope of picking up some movements of seabirds, but find the sea to be largely empty. We spend the night in a little hotel in Hilf to have some time to discuss and work on our presentation for 2 Feb to Shell, the Ministry of Environment and Climate Affairs, Environment Society Oman and other invitees. We have a lot of information and some recommendations and ideas to share! In the morning of 1 Feb, before heading to the boat back to Shannah, we make an early morning visit to a little bit of wooded vegetation close to the desalination plant where a little freshwater stream attracts a nice assembly of birds: Green Sandpiper, Wood Sandpiper, Common Sandpiper, Common Snipe, Night Heron, Kingfisher, Grey Wagtail and singing Chiffchaff. After a one hour boat ride with Tom and Jerry cartoons (in German) in a cabin at refrigerator temperature and no birds outside, we took off for our long ride to Muscat, where we arrived safely towards the evening. Few more hours of preparation needed for the presentations for tomorrow but all in the team have a very satisfied feeling about having successfully completed this count of Barr al Hikman. For me personally one of the most pristine and intact ‘wadden’ sites that I have seen. Observing this system in function, with the birds as one of its most visible components, is something I will never forget. Even burning midnight oil working on the data and pictures for the presentation is a pleasure! Getting ready for sharing our enthusiasm on World Wetland Day tomorrow! 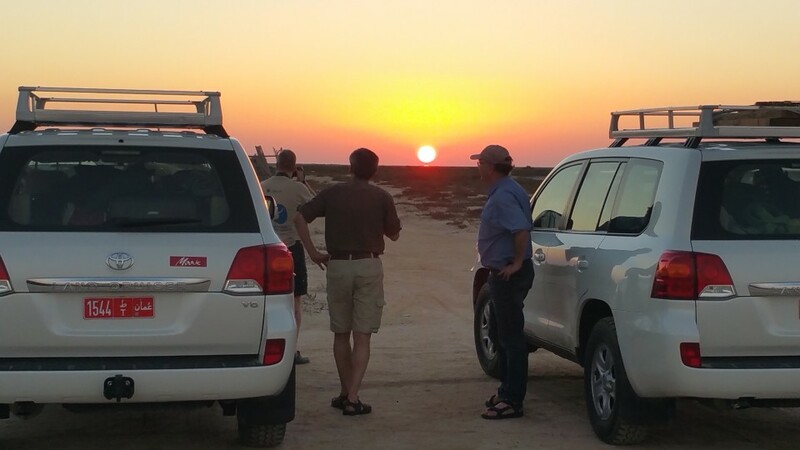 The IWC team counting in Oman consists of volunteers, Kees Camphuijsen, Lenze Hofstee, Leon Kelder and Steven de Bie, as well as Wetlands International Associate Expert Szabolcs Nagy and Ward Hagemeijer, Wetlands International’s Head of Business and Ecosystems.